Charles Fipke’s homebred Seeking the Soul could be headed to the Breeders’ Cup World Championships on Nov. 3 at Churchill Downs after scoring a 1 ¼-length victory over Nice Not Nice and Giant Expectations in Saturday night’s 26th renewal of the $100,000 Ack Ack Presented by GE Appliances (Grade III) beneath the historic Twin Spires. Seeking the Soul, ridden by Brian Hernandez Jr. and trained by Dallas Stewart, ran one mile in 1:35.01. C. Z. 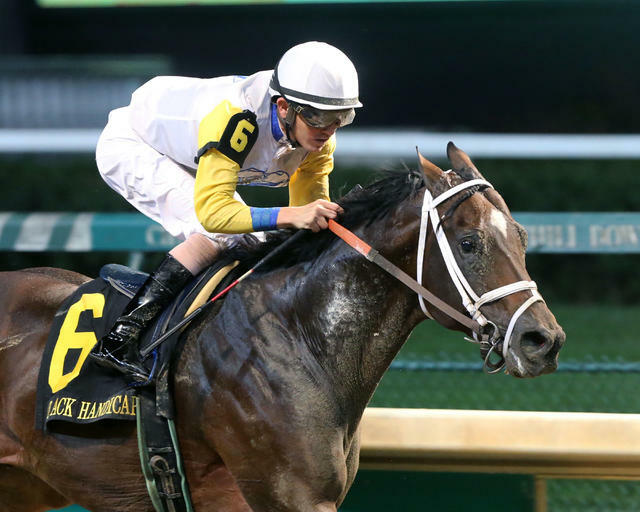 Rocket, the 6-5 favorite in the field of six, and Churchill Downs Racing Club’s Warrior’s Club set a slow early pace – :24.03 for the first quarter mile and :47.63 for the half – as Seeking the Soul raced only a couple of lengths back while in the clear mid-pack. Seeking the Soul commenced his winning move around the turn, took over at the top of the lane and repelled challenges from Nice Not Nice, Giant Expectations, C. Z. Rocket and Awesome Slew, who all made bids and chased the eventual winner. Warrior’s Club faded to last. The first prize was $61,380 and hiked Seeking the Soul’s bankroll to $1,482,542 with a record of 21-6-4-5. Seeking the Soul, the 7-2 second betting choice, paid $9.20, $5.20 and $3.40. Nice Not Nice, ridden by Gabriel Saez, returned $12.60 and $4.80. Southern California-invader Giant Expectations, under Julien Leparoux, paid $4.40. Seeking the Soul is Kentucky-bred son of Perfect Soul (IRE) out of the Seeking the Gold mare Seeking the Title. Fipke and Stewart have plenty of options for Seeking the Soul’s next start, which could come in either the $6 million Breeders’ Cup Classic (GI) or $1 million Breeders’ Cup Dirt Mile (GI). Four of the last five Ack Ack winners – Pants On Fire (2013), Tapiture (2015), Tom’s Ready (2016) and Awesome Slew (2017) – used the race as a springboard to the Breeders’ Cup Dirt Mile. For Hernandez, it was his third Ack Ack win after previous riding Neck ’n Neck (2012) and Tom’s Ready (2016) to victories. Stewart was the trainer of the latter. The race is named in honor of Cain Hoy Stable’s 1971 Horse of the Year Ack Ack, who is enshrined in the National Museum of Racing and Hall of Fame. In his only Churchill Downs appearance, Ack Ack won the 1969 Derby Trial in 1:34.40 which was a track record for one mile that has since been eclipsed.